Who doesn’t love getting a present? Don’t you just enjoy the excitement and anticipation when opening a nicely wrapped gift? We want to present you with a Viennese start-up that is dealing with these happy moments every day. The basic idea of Simplewish is to help groups organize their gifts for their loved ones. On their website www.simplewish.eu you can easily create a new GiftBox. You pick the present you want to give away (or if you organize it for yourself, the one you would like to receive), say a PlayStation, and add it to your GiftBox. Then you invite your friends that you want to chip in for your present. Everyone can then decide how much he or she would like to contribute, either via direct transaction, credit card or PayPal. The amount of money that people are giving is not being disclosed; you can only see how much you still need for your PlayStation. Once enough money was raised you can directly order the PlayStation. If you still miss a few Euros you can instead generate a voucher for your present with the paid amount. At the moment Simplewish is working with Amazon and jollydays as partners. Everything on offer from those two companies can be added to your personal GiftBox. At the end of the process you can also produce a personalized greeting card. It is that easy to organize your group gifts now! And it’s getting even simpler! Simplewish recently conducted a usability study in cooperation with the University of Applied Sciences in St. Pölten. “This externally conducted study was a great eye opener. We got insights that we ourselves just did not think about anymore.”, says Adrian Zettl, responsible for the start-up’s marketing and PR. Simplewish is constantly working with these new insights to improve their service. 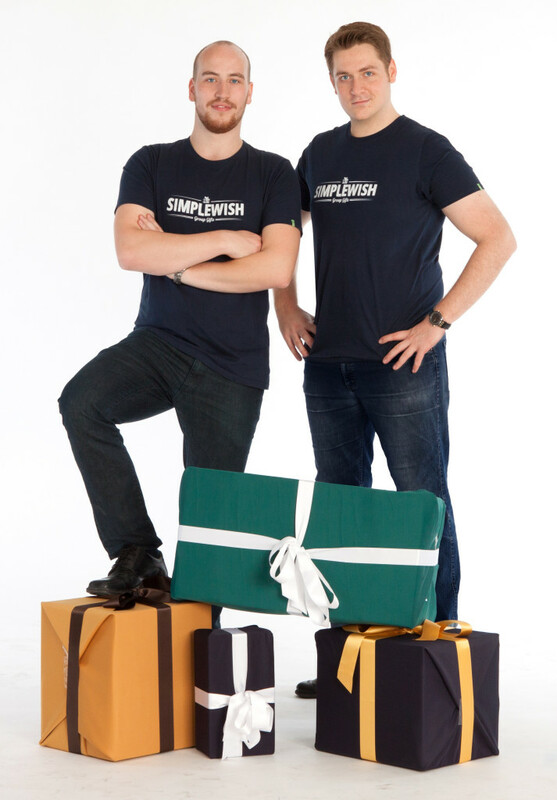 CEO Valentin Aschermann and CTO Christoph Bitzner founded Simplewish last year. Valentin has a degree in business administration where he specialized in management for small and medium-sized businesses, entrepreneurship & innovation and e-businesses. Christoph has, in addition to his studies (entrepreneurship & innovation, information management), several years of experience in coordinating web projects and is responsible for Simplewish’s frontend development. Christoph Aschberger and Jakob Reiter support him with the technical implementation. Designer Dina Tasic gives Simplewish its look. To complete the team Julia Spatzierer, Adrian Zettl and Maria Hochstöger handle the daily business of the start-up. The idea for Simplewish was born when Valentin celebrated his Bachelor degree. He organized a party with about 50 people and received quite some congratulation-presents; among these were 23 bottles of wine. He roughly calculated that the value of these gifts amounted to the price of the digital camera he would have loved to have. Valentin knew about the problems of big groups organizing one gift together. Firstly, not everyone invited to the party might know each other and secondly, you need to find one person taking charge of buying the present and then collecting the money from everyone involved. What a pain! Better to give your pal a bottle of Chardonney, right? That was when Valentin decided to make it easier for groups to organize presents together. Having his background in economics he told his friend Christoph, who he knew to have the relevant technical knowledge, about his idea. Together they developed a concept which they implemented with the support of two programmers. Simplewish was born in December 2012, since the beginning of 2013 the system is up and running and is constantly iterated and improved. 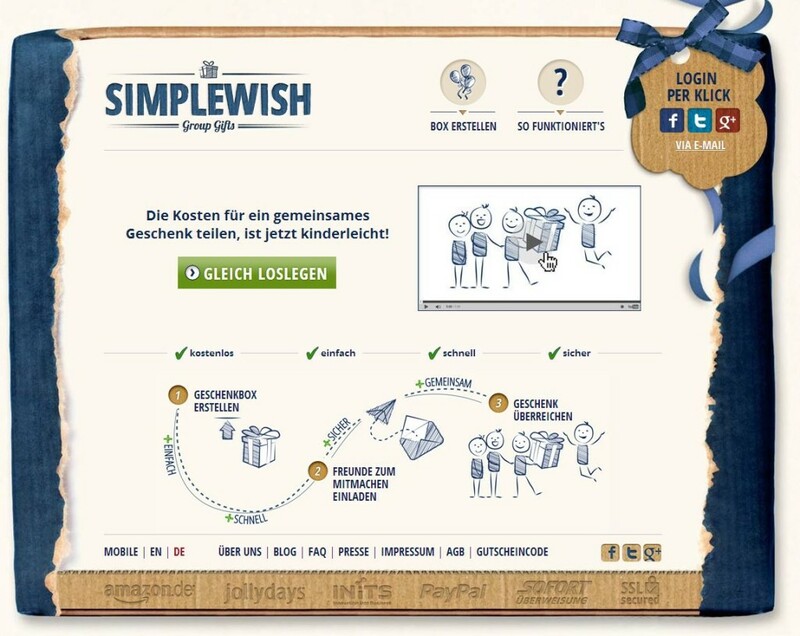 At the moment Simplewish counts about 5000 users within Austria and Germany. The biggest challenges for the start-up is to convince potential users that organizing group presents is now really straightforward and to explain the benefits of Simplewish in a short and persuading way. Another hurdle to overcome is to stay in peoples’ heads. 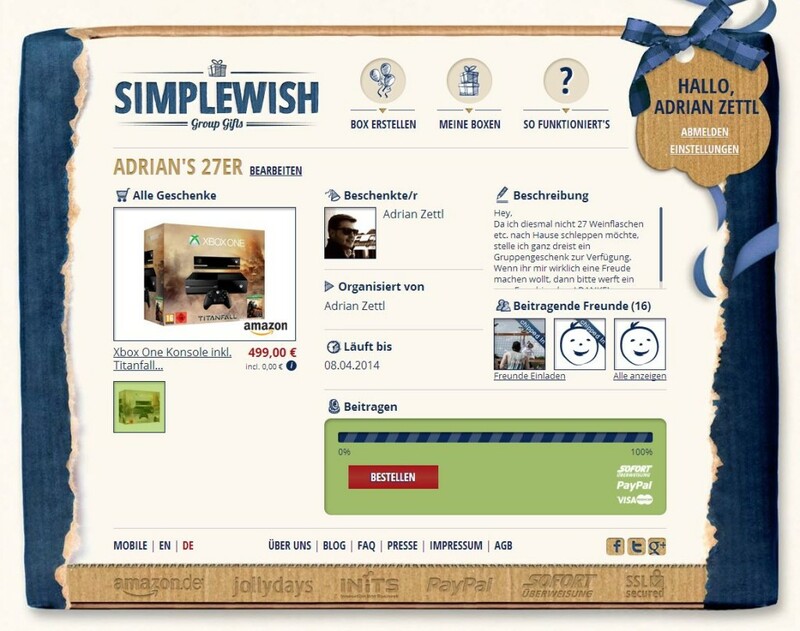 Often users love the idea of Simplewish and found it easy to contribute to a friend’s birthday present but when the time comes to start a GiftBox from scratch they tend to forget that this efficient solution is out there waiting to make their life easier. Simplewish is free of charge for its online user community. The start-up is earning commissions from its partners for every product that is sold via their platform. At the moment Simplewish is still dependent on external funding. The start-up was part of the INiTS incubator program, was funded as innovation project by the Viennese economic agency ZIT, was supported with a usability study by the Austrian Research Promotion Agency FFG and obtained funding from AWS. Simplewish is currently negotiating with potential new partners to extend its range of available presents. That means you might soon be able to put concert and event tickets for Austria and beyond into your GiftBox. A positive outcome of these negotiations might also add a large online fashion retailer, a holiday provider and an airline to the list of Simplewish’s partners. The goal is to cover as many typical gifts as possible. Addtitionally, the start-up is developing a B2B social commerce solution for online retailers. A pilot project was started with partner Jollydays. When purchasing from this online retailer you now get the option to share the cost of the present with your friends. The Simplewish process is started directly from the online shop. The B2B solution already generated great interest from various online retailers. The reason: Instead of one person eventually visiting the site and buying the present, the Simplewish option lets the offering go viral. On average 30 additional people become aware of the retailer and its product just by being invited to contribute to the chosen present. The start-up is also planning to introduce an open GiftBox which allows, in exchange for a small fee, to organize a present independent of any partners, say you found something really special on the flea market. Another use-case that is being explored by the start-up are wedding lists. Simplewish might then offer an easy way to set up and manage these wish lists for this special day. For tips and stories about presents read the Simplewish Blog. Happy giving!